A block is a group of entities. Blocks can be inserted into the same drawing more than once with different attributes, locations, scale and rotation angle (see image below). Such an instance of a block is usually called an "insert". Inserts have attributes just like entities and layers. An Entity that is part of an insert can have its own attributes or share the attributes of the insert. Once created, inserts are still linked to the block they instantiate. The power of inserts is, that you can modify the block once and all inserts will be updated accordingly. Creating and saving blocks is a useful way of inserting frequently used symbols e.g windows and doors in a house plan. Blocks can contain useful text, dimensions and reference notes. Blocks can be created from scratch or they can be created from existing entities. If you have already drawn the entities that you want to convert into a block use the following steps. Once all desired entities have been selected finalise the selection with the ENTER key. 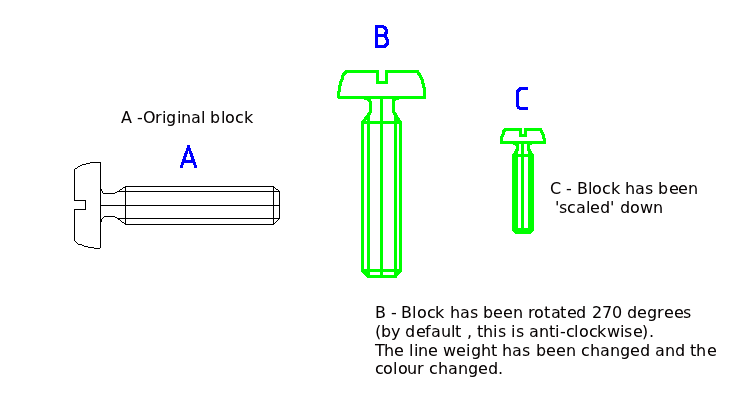 A block can also be created before placing it in the main drawing. Draw new entities that will compose the new block. You can also use the library browser. Set the path in Application Preferences, and have blocks in sub-directories of that path. This page was last modified on 30 December 2018, at 01:38.